Una Mesa para la Gente celebrates the diverse backgrounds, experiences, and talents that people bring to the Westside community. Painted in the iconic cartoon style of Cruz Ortiz, the mural shows twelve different people, including a chicken-footed conjunto musician, Lydia Mendoza, and Jesus Christ, sharing a family meal. This image of people from all walks of life sitting around the same table represent diversity and solidarity in the Westside community. Each person brings something to the table. From the top left corner, a hotel worker brings her skilled hands, Lydia Mendoza brings her Tejano-Conjunto music, a mechanic brings his tools, an abuelita serves a bowl of delicious caldo, a zapatista offers knowledge of human rights, Jesus Christ brights teaches on love, a young man in a wheelchair brings his story and experiences, a single parent brings her listening ear, a conjunto musician brings his instruments, a vato loco brings his artistic skills, a chicana student brings her knowledge, labor activist Emma Tenayuca brings hope, and Emiliano Zapata brings the Aztec symbol for Movement. ​ The restored mural is similar to the original, with a few modifications: the paintings of the sun and moon are replaced with mosaics, Jesus’ skin is a shade darker, and the vato loco artist in a bandana is replaced with with a chicana artist in glasses. The restored mural also includes a handful of smaller mosaic pieces, such as Emma Tenayuca’s speech symbols and handheld star, the abuelita’s caldo, Jesus’ sacred heart and crucifix, the conjunto musician’s musical notes, and the chicana’s paintbrush. The original mural was painted at the Monterey Car Wash and blessed on February 26, 2000. San Anto Cultural Arts co-founder Cruz Ortiz co-lead this mural with Lisa Veracruz, a seventeen-year-old artist, high school senior, and mother of two. 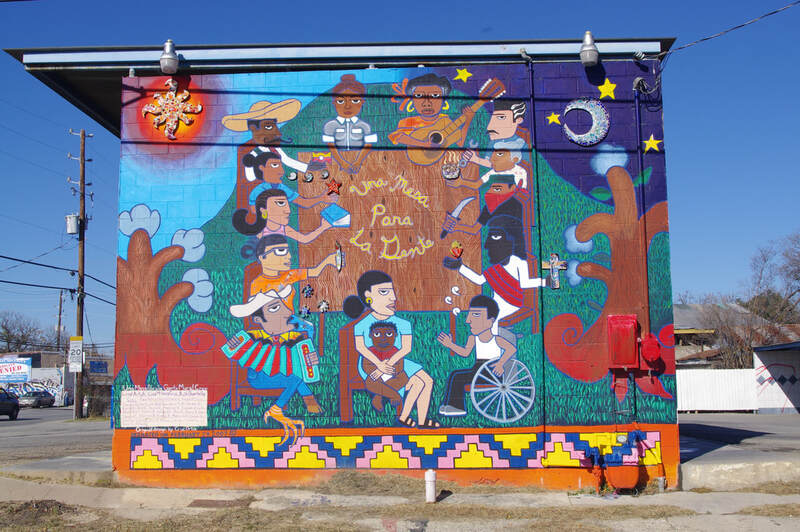 Residents of the Prospect Hill barrio help design the mural through workshops held at Divine Redeemer Presbyterian House of Neighborly Service. The mural blessing featured speeches from Manuel Castillo and Patti Radle, poetry from Victoria Garcia-Zapata and Nephtali Deleon, and live music from Sexto Sol, Aztec empire, and Manuel Mendoza, brother of Lydia Mendoza. Ruth Buentello lead a restoration of Una Mesa para la Gente in 2009, collaborating with original artist Lisa Veracruz. Father Marty from Our Lady of Guadalupe Church blessed the restored mural at a celebration that included food catered by HEB, poetry readings from Victoria Garcia Zapata Klein and Pancho mendoza, and music by DJ Jay Jay Lopez and Sexto Sol. Although successful, the mural blessing was also a trying time because it was San Anto’s first blessing ceremony without Manny Castillo. Artists dedicated the restored mural to his memory. and thicker walls for the drive-by’s! every body ready to rock and roll! nombre, y luego que sale el diablo en Camaroncito! he was a’ready to dance and joody boog…! it ain’t no lie -- I saw it with my own eyes! in the local barrio esquina! San Anto Cultural arts! on a corner street - hooray! with a big munchie plate!